We arrive at the YMCA for the first time, I get the kids settled into their Tae Kwon Do class and I head down the hall to the aerobic studio, a few minutes before the class is to begin. I'm feeling so confident about my Step Aerobics skills and abilities. My thoughts go something like this..... "I'm really good at Step Aerobics! I'm probably better than most in this room. I hope we do some fancy jumps and cool moves, because I'm sure I already know all the footwork. This better not be a beginner class, I need a good workout. After tonight, the instructor will think I teach Step at another gym." As I walk in I see many aerobic steps all laid out on the floor and lots of people standing in the back. I walk over to a step in the middle of the room and start stretching. A few people are staring at me, as a woman comes over and tells me I'm using 'her' step. Apparently, proper class etiquette is to get out your own step from the massive stack in the front of the room and place it on the floor. I apologize and humbly walk to the front to get my own step. At this time, class is getting started and the only open spot is center front, right by the instructor in view of the mirrors---"Perfect, I'll get to watch myself!" I choose double risers to place my step on. 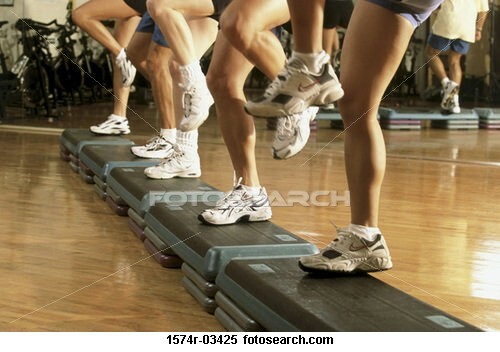 Steps are set on top of risers to make your step higher, which results in a more intense workout. You can use a step with no risers, one riser, double risers or more. At home in front of the TV, I always use double risers because I want a workout. I glance around the room and see only two other people using the double risers, (the instructor only had one riser) that's when I should have had a clue about this class. The stacks of steps and risers. I'm really dragging my legs up to reach my high step. What have I done? I look in the mirror and see this deep, red color taking over my oxygen-deprived body as I try to breathe, stay on my step and dance at the same time! The color of my face is so red that I'm sure people are thinking I may pass out any minute! I try to breathe more, but I'm concentrating so hard, I just can't. At the first water break I am so tempted to put my risers back on the pile, but of course that would mean everyone in the room would see me...I don't want to embarrass myself. I instead gulp down half my water bottle (that was a mistake) and battle miserably through the rest of the class. Some crazy moves are introduced that I've never seen before. The speed is so fast, I start getting dizzy. My step feels higher and higher with each move I do. I trip over my step at least twice, lose my place multiple times and basically stumble through most of the routine. 45 minutes later, no water left except what had been sloshing around in my stomach (causing major side aches), the class finally ends. Uh! Relief! As I put my step away, I wonder if God is smiling at me as I am reminded of my prideful, sinful self. Yep, me and my Step Aerobic pride, shattered to pieces tonight. Step Aerobics just happens to be one place (at this moment) where I'm reminded of my pride. Throughout the day, I have so many other occasions where my prideful self takes over. Do nothing out of selfish ambition or vain conceit, but in humility consider others better than yourselves. Philippians 2:3. Why is it so easy to fall into this prideful state of mind so often? Why can't I keep my mind pure and humble and full of His love? Why am I constantly comparing myself with others? As I ask these questions, I realize I know the answers. I'm a sinful being. I am full of sin, and I need to constantly ask for forgiveness. There is nothing righteous, pure or humble about me, EXCEPT that I have Jesus Christ as my Savior. Jesus has the power to take away all my ugly pride and cleanse me and make me clean within. I want that, Jesus...I need that, Jesus. I want to do better. Forgive me for my attitude, Jesus. Thank you for taking away my sin with your death on the cross. I am not worthy of Your grace or Your gift, You have so freely given me. As we're walking out of the YMCA that night, my son turns to me and says, "Mom, your face looks really weird, are you OK?" So, tonight I'm trying out the Step Aerobic class once again. This time I will arrive earlier and remember to pick up a towel (or two!). I will get out my own step, humbly choosing one riser and I will take a spot in the back of the class. I just wonder what color my face will be? God is still working on me...step by step by step.